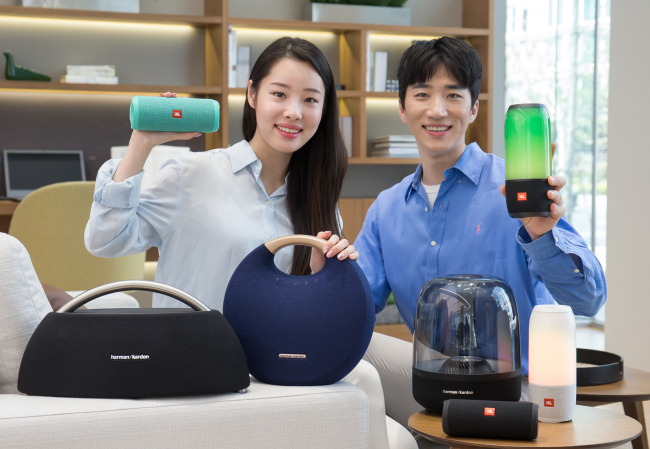 Harman International, a subsidiary of South Korea’s Samsung Electronics, has maintained its top position in the global wireless speaker market for the last four consecutive years, Samsung announced Sunday. According to data by Futuresource Consulting, Harman’s premium audio brand JBL and Harman Kardon claimed 35.7 percent of the global market last year, retaining the market leader’s position since 2015. US firm Harman was acquired by Samsung in 2016 with an aim to apply its sound technology to the company’s mobile and home appliance products, and to further seek collaboration with the audio business on developing the future automotive infotainment system. Harman markets its speakers based on their water-resistance, portability, connectivity and long running hours. Samsung has been increasing Harman’s sales points in Korea since the acquisition. At shopping mall Starfield Hanam in Gyeonggi Province, Samsung’s Harman Studio offers consumers the chance to experience the Harman speakers and sound quality. Similar studios are installed at nine retail electronics shops in Seoul and nearby areas. “The company will continue maintaining its global reputation in the Korean market,” said a Samsung official.